A 6-8 m tall obelisk honouring the former Polish King Jan Sobieski ranks second only to Lenin’s statue as one of Tovste’s famous ‘invisible’ monuments. 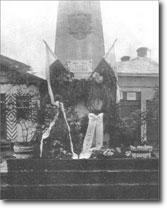 The obelisk pictured here, guarded by a Polish soldier, was situated alongside the main road, Ukrainska Str. just north of the Roman Catholic church. It was erected in 1933 in honour of the 250th anniversary of Sobieski’s brilliant military victory over the Turks at the Kahlenberg, near Vienna, on 12 September 1683, said to be one of the decisive battles of European history. Jan Sobieski was born into lesser nobility and rose through the ranks to become field commander of the Polish army in 1666. 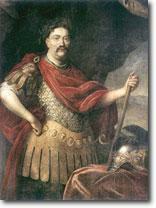 In spring 1668, a further victory over the Turks and Cossacks near Podhajce (Podhayits in modern Ukraine), about 65 km northwest of Tluste, assured him of the title of commander in chief when he returned triumphantly to Warsaw. Successive military victories only enhanced his reputation and, in 1674, he was elected king. In 1683, he concluded a treaty with the Holy Roman emperor Leopold I against the Turks, under the terms of which each ally had to support the other if the other's capital were to be besieged. When a great Turkish army approached Vienna late in the summer of 1683, Sobieski himself rushed there with about 25,000 men. He took personal command of the entire relief force of about 75,000 men, and secured the victory that came be honoured in Tluste 250 years later. The Bolsheviks pulled down the monument to Sobieski around 1948-49 and buried it under what is today the sidewalk running alongside the street. Though it can no longer be seen, a slight rise in the pavement gives evidence of its existence. Although suggestions have been made in the past to excavate it, nothing has come to pass for lack of funds.